HALIFAX – Contracts for major components of Nova Scotia’s electronic health record system were announced earlier this month by provincial Health Minister Chris d’Entremont. The components include a secure health record storage and viewing system for patient information, which doctors and other healthcare workers can access when and where they need to. A client and provider registry will also be created to identify patients and healthcare providers, and to link medical records from multiple systems. The province’s electronic health record system, called SHARE (Secure Health Access Record), will create an electronic health record for all Nova Scotians. The record will contain patients’ up-to-date health information to support decision-making and case management by healthcare providers. The first phase of the SHARE system will be completed by Dec. 31, 2009 and will cost $28 million. Nova Scotia has partnered with Canada Health Infoway, which is contributing $17.8 million. The first phase will include patient information from the province’s three lab systems, the diagnostic imaging system and clinical records from provincial hospitals. “Nova Scotia is making a significant leap towards providing every resident with an electronic health record,” said Richard Alvarez, President and CEO of Canada Health Infoway, the federally-funded, independent not-for-profit organization which invests with public sector partners to accelerate adoption of electronic health records across Canada. The Department of Health has signed agreements with Initiate Systems for its client and provider registry software, implementation services and training ($3.2 million), and McKesson Canada for its Horizon Physician Portal for the viewer and Horizon Care Record for the clinical repository for secure health record storage ($2.4 million). A third contract has been awarded to a local consortium led by Sierra Systems, including xwave and the Barrington Consulting Group, to set up a project management office to oversee system integration ($5.3 million over two years). 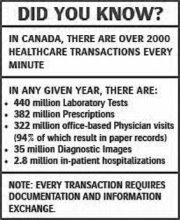 Canada Health Infoway is leading the development and implementation of electronic health projects across Canada. Infoway works with provinces and territories to invest in electronic health projects, which support safer, more efficient healthcare delivery. Fully respecting patient confidentiality, these private and secure systems provide healthcare professionals with immediate access to complete and accurate patient information, enabling better decisions about diagnosis and treatment. The result is a sustainable healthcare system offering improved quality, accessibility, productivity and cost savings. 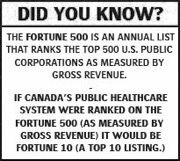 View the original article in Canadian Healthcare Technology Magazine. Google Inc. will begin storing the medical records of a few thousand people as it tests a long-awaited health service that's likely to raise more concerns about the volume of sensitive information entrusted to the internet search leader. The pilot project to be announced Thursday will involve 1,500 to 10,000 patients at the Cleveland Clinic who volunteered to an electronic transfer of their personal health records so they can be retrieved through Google's new service, which won't be open to the general public. Each health profile, including information about prescriptions, allergies and medical histories, will be protected by a password that's also required to use other Google services such as e-mail and personalized search tools. Google views its expansion into health records management as a logical extension because its search engine already processes millions of requests from people trying to find more information about an injury, illness or recommended treatment. But the health venture also will provide more fodder for privacy watchdogs who believe Google already knows too much about the interests and habits of its users as its computers log their search requests and store their e-mail discussions. Prodded by the criticism, Google last year introduced a new system that purges people's search records after 18 months. In a show of its privacy commitment, Google also successfully rebuffed the U.S. Justice Department's demand to examine millions of its users' search requests in a court battle two years ago. Pilot project has uncertain timetableThe Mountain View-based company hasn't specified a timetable for unveiling the health service, which has been the source of much speculation for the past two years. Marissa Mayer, the Google executive overseeing the health project, has previously said the service would debut in 2008. Contacted Wednesday, a Google spokesman declined to elaborate on its plans. The Associated Press learned about the pilot project from the Cleveland Clinic, a not-for-profit medical cente founded 87 years ago. The clinic already keeps the personal health records of more than 120,000 patients on its own online service called MyChart. Patients who transfer the information to Google would still be able to get the data quickly even if they were no longer being treated by the Cleveland Clinic. "We believe patients should be able to easily access and manage their own health information," Mayer said in a statement supplied by the Cleveland Clinic. The Cleveland Clinic decided to work with Google "to create a more efficient and effective national health care system," said C. Martin Harris, the medical centre's chief information officer. Google isn't the first high-tech heavyweight to set up an online filing cabinet in an effort to make it easier for people to get their medical records after they change doctors or health insurance plans. Rival Microsoft Corp. last year introduced a similar service called HealthVault, and AOL co-founder Steve Case is backing Revolution Health, which also offers online tools for managing personal health histories. The third-party services are troublesome because they aren't covered by the Health Insurance Portability and Accountability Act, or HIPPA, said Pam Dixon, executive director of the World Privacy Forum, which just issued a cautionary report on the topic. Passed in 1996, HIPPA established strict standards that classify medical information as a privileged communication between a doctor and patient. Among other things, the law requires a doctor to notify a patient when subpoenaed for a medical record. That means a patient who agrees to transfer medical records to an external health service run by Google or Microsoft could be unwittingly making it easier for the government or some other legal adversary to obtain the information, Dixon said. If the medical records aren't protected by HIPPA, the information conceivably also could be used for marketing purposes. Google, which runs the internet's most lucrative ad network, typically bases its marketing messages on search requests and the content on web pages and e-mail contained in its computers. It's not clear how Google intends to make money from its health service. The company sometimes introduces new products without ads just to give people more reason to visit its website, betting the increased traffic will boost its profits in the long run.